Patience, originally uploaded by [Zakkaliciousness]. While many cyclists jockey for a front position off the line when the light changes, there are some more sophisticated creatures who are content with their position at the back of the pack. There is something inherently lovely about bikes and umbrellas. 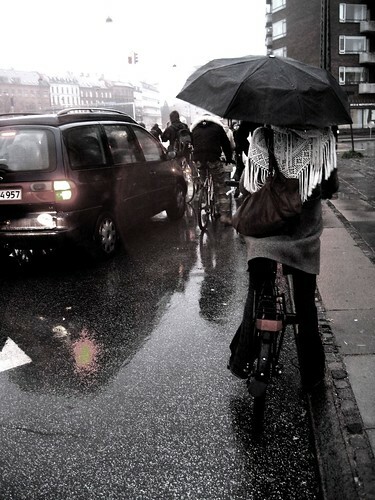 And biking with umbrellas is not as rare a sight in Copenhagen as one may think. I have a number of other shots over at Flickr. Or just click here to see them all. oh, i think it is unconfortable, but better than contribute to increase the climate change driving a car!!! i don't mind it in light rain. but wind is too irritating. Love your site. What's in the road - the white speckles? I commuted to work in Chicago for five years. Never once did we get the views on wheels that you have. the white speckles are just a part of the asphalt. no idea.